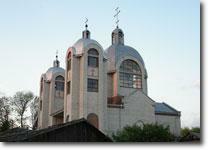 After Ukrainian independence in 1991, Orthodox Christians began construction of a new church in Tovste, next to the old cemetery. The church of simple design, made of plain grey brick, was completed in 1995. An article that appeared in the 27 July 2005 online edition of The Moscow Times, entitled ‘No End to the Schism’ provides an informative account of the centuries-old struggle between the Ukrainian Orthodox and Greek Catholic (Uniate) Churches, which continues to this day.